Milton’s Bicentennial in 1998 marked the Academy’s charter, given in 1798 under the Massachusetts land-grant policy. It bequeathed to the school a responsibility to “open the way for all the people to a higher order of education than the common schools can supply” (Richard Hale, Milton Academy, 1948). Milton was established as a coeducational day school, and preparation for college was the primary goal of the school’s program. Just after the school’s centennial, reacting to a marked increase in the interest of separate education for young women, the Academy was divided into separate schools. For many years, the Milton Academy Boys’ School and Girls’ School maintained separate faculties, facilities and student bodies. Today, Milton has returned to its coeducational roots. Academic standards, facilities, endowment resources, curricular and extra-curricular offerings, the size of the faculty and student body, admission applications and annual giving—all facets of the Academy’s activities—have strengthened and expanded during the School’s second century. Milton has consciously nurtured and enhanced a vibrant campus life, and today, both young people and adults at Milton cite the diversity of the school community as a crucial element of living and learning. Students and faculty at Milton, as varied and exciting as they are, attract others who want to learn and to teach in a stimulating environment. One of Milton’s strengths is maintaining a campus life that optimizes the benefits of a boarding school and a day school. The full involvement of both of these student populations in the life of the school enhances and broadens the experience of each of the respective groups. Both boarding students and day students lead and participate in all aspects of School life. Milton Academy distinguishes itself by building a vital and effective community based on self-confidence and respect of individuals. The School fosters an atmosphere of intellectual freedom and responsibility and encourages initiative and the open exchange of ideas. Doing so demands considerable energy. Teaching and learning at Milton Academy are active processes, encouraged and supported by common respect for the intelligence, talents and potential of each member of the School. Adopted in 1898, Milton’s motto resounds in the minds and hearts of today’s students and graduates. 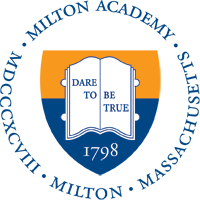 Often cited by both faculty and students as the litmus test for word or action, “Dare to be true” not only states a core value, it describes Milton’s culture. Milton believes that a vital and effective community is built on individuals’ self-confidence and shared respect. We do our best to foster an atmosphere of intellectual freedom, and we encourage initiative and the open exchange of ideas. Doing so requires considerable energy. Teaching and learning at Milton Academy are active processes, supported by the recognition of the intelligence, talents and potential of each member of the School. Grounded in values, deeply respectful of diversity, and fully aware of the issues of their time, Milton students graduate fully prepared to continue working to meet their own high expectations in the many venues which follow.